It was the most unlikely encounter of them all, simply because the Queensland cricket community was agreed that the old cricketer I was trying to track down had been dead for years. 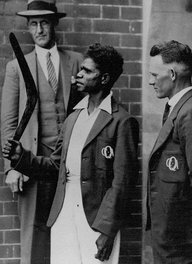 Days of painstaking investigation had revealed only one clue: Eddie Gilbert, the legendary and popular Aboriginal express bowler of the 1930s, had finished his days at a security unit west of Brisbane. So I went there, expecting at last to establish the date of death for cricket’s records. The superintendent grudgingly revealed that Eddie had been admitted in 1949, a sick man, an alcoholic, who had treated his wife badly. But exactly when had he died? After a few more evasive comments the man’s tone became clear: he was speaking of Eddie Gilbert in the present tense. “Surely he’s not here now, is he?” Indeed he was. Then I must see him! “I’m sorry. I can’t do that. It wouldn’t be any use. Eddie doesn’t speak. We’ve tried everything: put a cricket ball in his hand, he just stared at it, let it fall to the ground.” The poor old cricketer was in a bad way, quite heavily sedated. He had been a sensation in the 1930s, causing Don Bradman to finish up on the seat of his pants, then having him caught behind for a famous duck. The Don stated that it was the fastest spurt of bowling he ever experienced. Many other batsmen from bush, grade and state cricket gave similar testimony. Gilbert was no-balled in a Shield match, although today it’s assumed that colour prejudice alone kept him out of the Australian XI. Yet, having raised Australian spirits by hurting England’s aloof captain Douglas Jardine in Queensland’s match against the tourists, Eddie Gilbert bowled in the nets with the Australian team before the Bodyline Test at the Gabba, and had been listed by the Board among the Test possibilities. There was no colour bar. My heart thumped as the minutes ticked by. His black locks now silver, long arms dangling by his frail frame, the once-famous little black fast bowler stood at the doorway. His handshake was feeble. Having accepted a cigarette, he stared fixedly at the floor. There was no response to some gentle questioning. He just quietly wheezed, head slowly rocking. He was given a ballpoint. After an agonised minute he dropped it and shuffled backwards. That “E” that he managed to scrawl I now value as highly as any other autograph. At last he looked up. His deep-set, bloodshot eyes sent a shiver through Debbie as they met hers. “Thanks, Eddie,” said the boss. And the old fast bowler shuffled through the doorway, out into the harsh sunlight and across the parched ground. He died six years later. Alzheimer’s was discreetly entered as cause of death. Years later a decent headstone was placed on his grave at the Cherbourg Aboriginal settlement. In terms of curiosity, pathos and fanciful myth, Eddie Gilbert has a truly unique place in cricket’s long history. CricketWeb is extremely grateful to David Frith and his publisher, Patrick Ferriday of Von Krumm Publishing, for their permission to reproduce this extract and the accompanying images. I always used to enjoy this feature in the [I]Wisden Cricketer[/I] – it ran for a long time, a couple of years at least. I suppose it ended when the Wisden name was dropped.